My husband is finally in love with silicone ice trays. Why are these different? 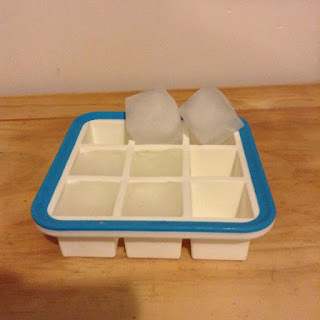 Because of the rigid blue rim that keeps the ice tray from wobbling all over the place. My husband is enjoying this ice tray very much. I love having fresh ice and he loves how easy these are to use. This tray makes 9 1.4 inch cubes. Great for water, tea, milk, breast milk, homemade baby food, etc. I have even made ice pops for my daughter by wrapping with wrap and then sticking in plastic spoons for a quick sore throat cure. This silicone ice tray can be found on Amazon. ✔ HIGHEST QUALITY TRAY MAKES 9 CUBES - Unique 2 color tray is made with BPA-free FDA-approved silicone & high quality steel & lets you make slow melting 1.4 inch ice cubes.